Big Bone Piranha Plants are the giant versions of Bone Piranha Plants, as well as the undead versions of Big Piranha Plants. 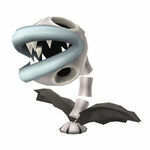 Like all the other undead enemies from New Super Mario Bros. 2, they are similar to their non-undead species, with the same strengths and weaknesses. Similarily to many of the other enemies in this game, Mario and Luigi can defeat this enemy with a single gold fireball and receive Coins. Like normal Bone Piranha Plants, it cannot be harmed by fire, but can be destroyed with either a Super Leaf, Gold Flower, or a Super Star. They appear in World Mushroom - , World 4- , and World 5- . Big Bone Piranha Plants appear as adversaries in Puzzle & Dragons: Super Mario Bros. Edition, where their attributes are Wood and Dark. That is, they are weak against any opponent that is attributed with Fire, but can resist easily to Water-attributed enemies. The large, skeleton plants have a large amount of power in attack, and their HP is pretty high, yet they have a very poor rating in regard of recovering their allies. A Big Bone Piranha Plant's skill is "Poison Smog", which turns every attribute orb of any enemy into its own orbs, these being, again, Wood and Dark. Nonetheless, this can be performed every 19 turns. When fought as enemies, Big Bone Piranha Plants always fight alone, due to their huge size. They attack every three turns, and can even poison the player's team. The Big Bone Piranha Plant's poison is much more damaging than that of the Bone Piranha Plant, especially at the later worlds. In Super Smash Bros. Ultimate, Big Bone Piranha Plants (just called Big Bone Piranhas) are mentioned briefly by Viridi during Palutena's Guidance dialogue for Piranha Plant. ↑ von Esmarch, Nick. 2012. New Super Mario Bros. 2 Prima Official Game Guide. Page 23. ↑ Shogakukan. 2015. Super Mario Bros. Hyakka: Nintendo Kōshiki Guidebook, New Super Mario Bros. 2 section, page 195. This page was last edited on February 13, 2019, at 17:31.